Dodge Street is a street in the Cold Springs neighborhood on the East Side of Buffalo. 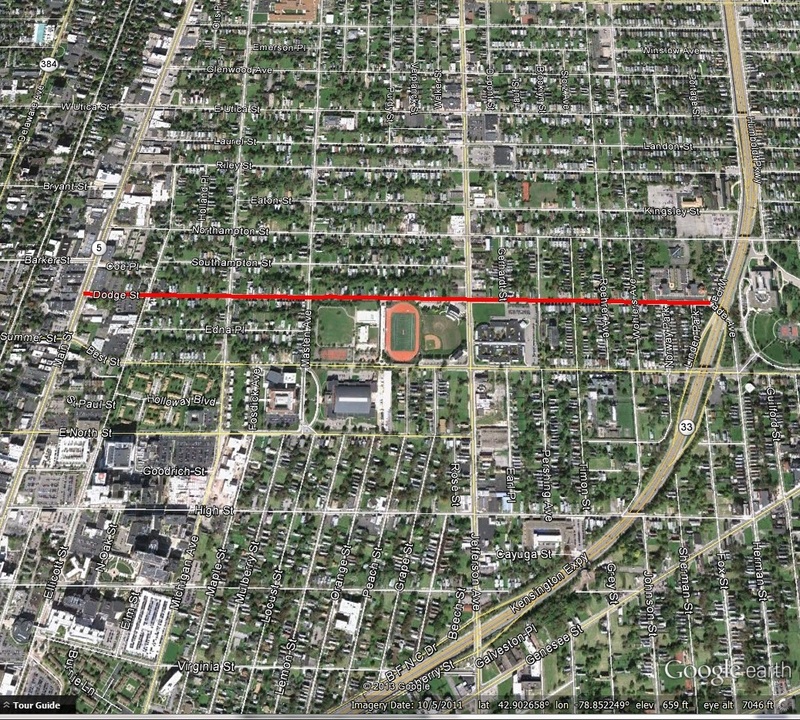 The street runs for about a mile, from Main Street to Humboldt Parkway and is named for Alvan Leonard Dodge. Alvan’s father, Alvan Senior was considered courageous when he built a log cabin on Main Street, north of Summer Street in 1811. At the time, this was well outside the Village limits and well into the primeval forests. The area was at high risk for attacks from the Native Americans. However, the Dodge family lucked out when the village was burned in 1813, as their house was well outside the village, and therefore, left standing. They were one of the few families to be able to return to their home following the fire. Alvan Senior served as Magistrate of the County of Niagara (at the time, Niagara County included what is now Erie County) and held other official positions in the towns of Black Rock and Buffalo. 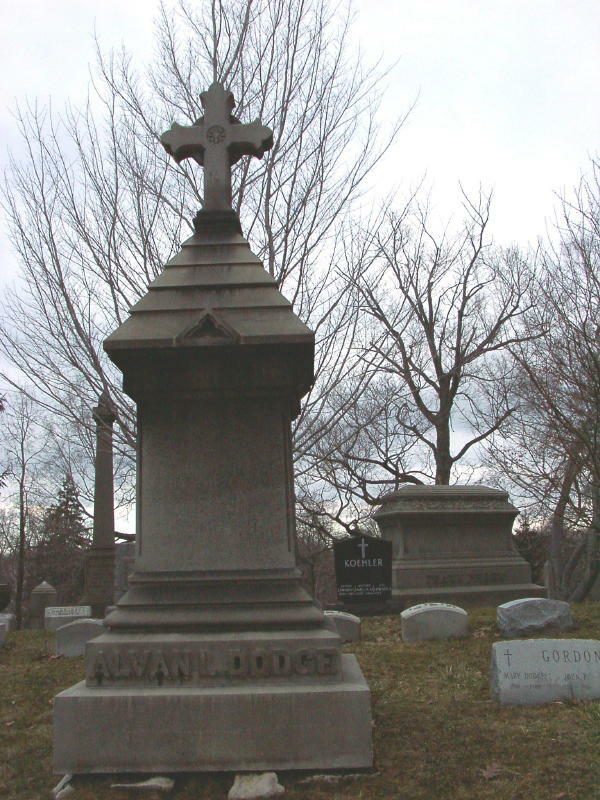 Alvan Senior died in 1846 and is buried at Forest Lawn. Alvan Leonard Dodge witnessed Buffalo’s development from a tiny frontier village into one of the most important cities in the country. By the end of his life, the Dodge family farm was close to being in the middle of the City that had grown up during Alvan’s lifetime. Alvan, Junior was born on March 21, 1808 in Lowville, NY and came with his family to settle in Buffalo in 1811. 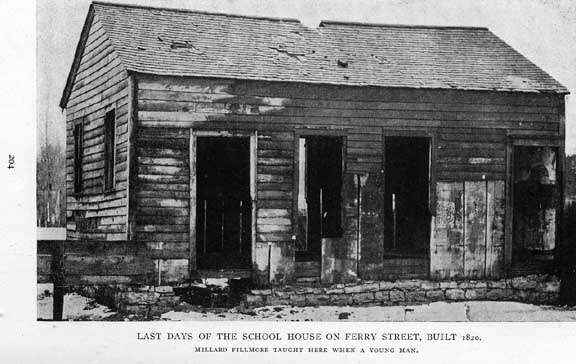 He was educated in the school in a schoolhouse on Ferry Street that was known as Buffalo District School #2 at the time. One term, his teacher was Millard Fillmore, who taught while he was also reading law and serving as postmaster. At the time, the actual Cold Springs still flowed through the neighborhood. The waters from this spring became the Jubilee Water Works, one of Buffalo’s first water systems. The springs feed into the lake in Forest Lawn Cemetery. As a young man, Alvan, Junior acquired a farm of several hundred acres, bounded by Main, East Ferry, Best and Jefferson. Mr. Dodge built a house at the corner of Main and Dodge Streets, using lumber cleared from his property to build the house. He sold part of his land to the City of Buffalo in 1880. After selling the land to the City, he subdivided the remainder of his property for development and laid out streets on his land. The area became the place for many prominent German families to live. Legend has it that there was one field that grew the best corn around, so Mr. Dodge refused to convert it to a building lot. The City used the property they had purchased to build a reservoir. At the time, the City relied on reservoirs for water service. This reservoir was known as Prospect Reservoir, since it replaced the reservoir of the same name which was located on Prospect Hill. When the Colonel Ward Pumping Station opened in 1915, it rendered most of the reservoirs obsolete. The reservoir sat unused until the 1930s. Between 1936 and 1938, Buffalo Civic Stadium was built as a WPA project. It was originally going to be named Roesch Memorial and then Grover Cleveland Stadium before Buffalo Civic Stadium became its official name. The stadium was nicknamed “The Rockpile” since it seemed to rise out of the quarried land that had been the reservoir. The stadium became home of the Buffalo Bills football team in 1946. The stadium was renamed War Memorial Stadium in 1960. The Buffalo Bisons baseball team used the stadium after Offerman Stadium at Michigan and East Ferry was demolished. The Bills left the stadium in 1972 when Rich Stadium was built. 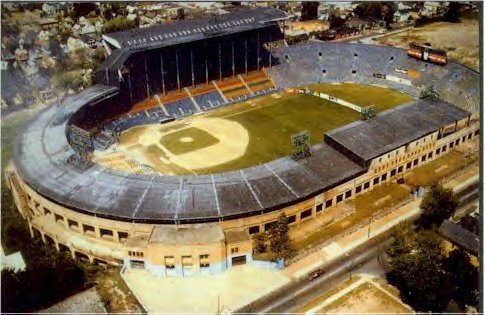 The Bisons left the stadium when Pilot Field opened in 1988. Once the stadium was empty, many of the nearby residents wanted the stadium demolished. The stadium hadn’t been maintained well during its final years and was in poor condition.. The Dodge-Jefferson and the Best-Jefferson entrances are all that remain today of War Memorial Stadium, which has been converted into the Johnnie B. Wiley Sports Pavilion. Johnnie B. Willey was a city resident who worked to help young people of the East Side. 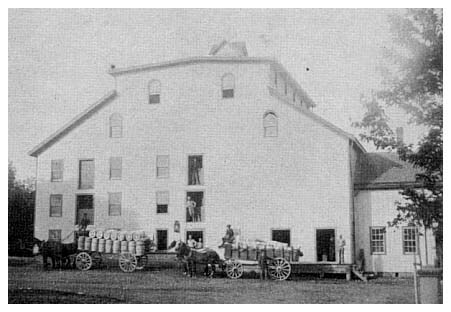 Alvan’s brother, J. Wayne Dodge moved to Williamsville and purchased the flour and grist-mill in 1864 and changed its name to Dodge Roller Mills. The Dodge Mill was across Glenn Falls from the Historic Williamsville Mill that is still standing today. Dodge Road in Amherst is named after J.Wayne Dodge. The Dodge Mill burned in 1894, Johnathan Dodge lost is life battling the fire. The foundations of the mill are still visible near the wall of the creek behind Mill Street. Alvan Dodge married Ruth Bosworth of Clarence. They had four sons and three daughters. He died in 1881 at the age of 73 and is buried in Forest Lawn. The Buffalo Courier said that “his life was quiet and relatively uneventful, yet his life was the history of Buffalo”. To read about other streets, be sure to check out the Street Index. Steele, O.G. “The Buffalo Common Schools”. Publications of the Buffalo Historical Society, Volume 1. Pg. 405. Smith, H. Perry. “History of the Town of Amherst, Chapter XXXIX” . History of the City of Buffalo and Erie County. D. Mason & Co Publishers: Syracuse, NY 1884. Was the famous gadfly Mabel Dodge Luhan related to these folks? Mabel herself was married into the Dodge family. Her husband, Edwin Dodge was an architect that was originally from Massachusetts. They may have been related further up the family tree. Interesting history of Buffalo, life was so hard back then! Wonderful job Angela. Truly inspiring. My grandfather Francesco Lucca took over the infamous Only Theater saloon..and helped bring civility and order to the wickedest street. Would love a street name after him. HE WAS A REAL GODFATHER, HELPING THOSE IN NEED. HAVE MANY STORIES OF HIS GENEROSITY.